When I go to the market for my weekly food shopping, I usually shop by habit. I know the layout of the market so it shouldn’t be rocket science to shop. I choose things by shape, color, and/or place. And that works 99% of the time. Except when they change things around. 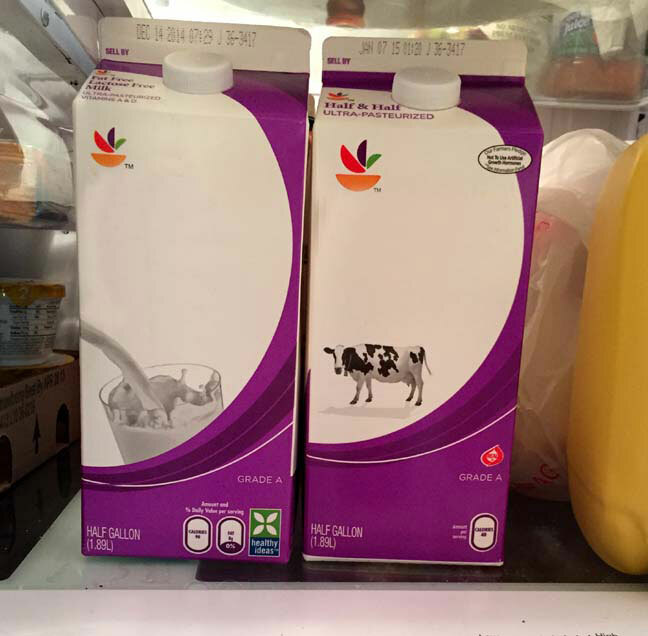 These two items were in the dairy case. I grabbed what I thought was Half and Half. Same color. Same shape. Same place. Well, sort of. They moved some of the dairy products around. What I bought instead was Fat Free Lactose Free Milk. Now here’s the funny thing. 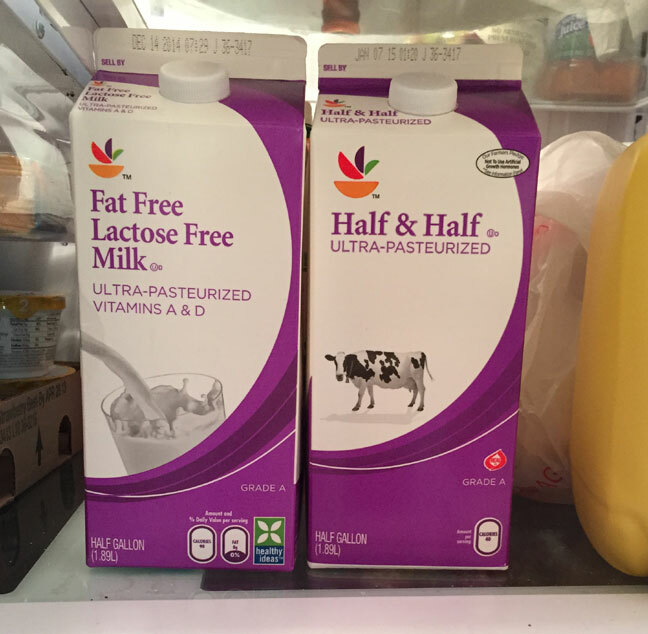 Neither Mr. Aitch nor I realized that I bought the wrong thing and he used the Fat Free Lactose Free Milk in his coffee all last week and the week before (when I wasn’t home). He thought there was something wrong with the coffee as it didn’t taste as rich. I discovered the error of my ways and told him about it Friday evening. He didn’t have coffee on Saturday or Sunday once he found out all we had in the house Fat Free Lactose Free Milk and not of Half and Half. Would you have had your coffee anyway or gone without? This entry was posted in food and tagged food, mistakes by Patti_is_knittinginflashes. Bookmark the permalink. Have gone to the store and got the right stuff . Or just suffer , not had any coffee, and wait for his sweetie pie to go in a few days. His choice.